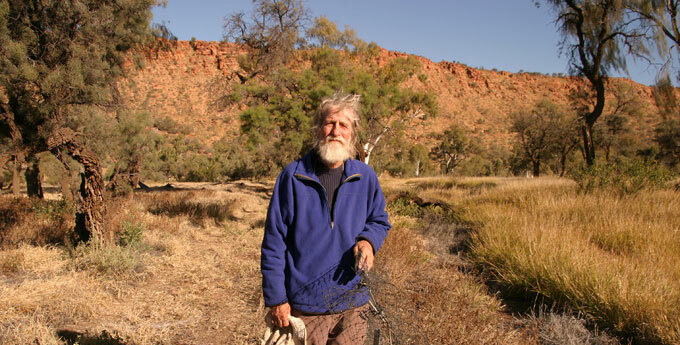 While trees mostly survive the “cooler” flames of native grass, many were destroyed, including trees in the West MacDonnell national park: “Where there is thick buffel under the mulgas they are dead.” ERWIN CHLANDA reports. With the funeral of a nephew who took his own life fresh in her mind, MLA Alison Anderson in last night’s Legislative Assembly debates asked for a breakdown of statistics on suicide in the Northern Territory. She wants to see what the picture is in urban, rural and remote settings, suspecting that, from her experience, young people in remote communities are more vulnerable. The nephew buried last week in Mutitjulu was the second in Ms Anderson’s family to suicide this winter. The second young man took his life in a suburban street of Alice Springs. He was buried in Hermannsburg on the same day as his father, who Ms Anderson says died from alcoholism. 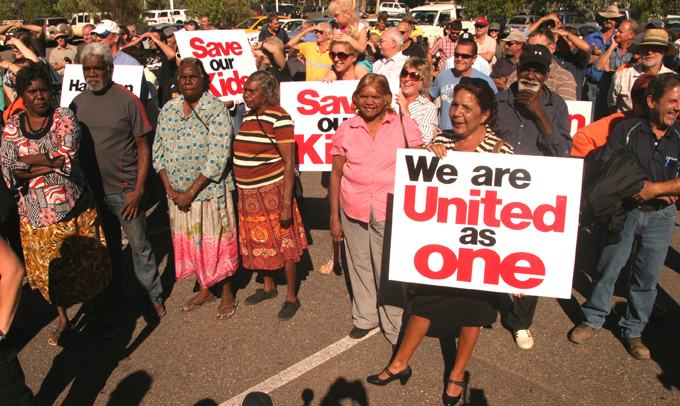 PICTURE ABOVE: MLA Alison Anderson at a rally this year outside Parliament during its sittings in Alice Springs. By her side is Councillor Mildred Inkamala (pink shirt) of the MacDonnell Shire Council. 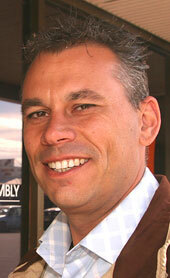 KIERAN FINNANE reports. Mayor Damien Ryan and Minister for Central Australia Karl Hampton, with two young helpers, took the launch of the Alice Springs Festival literally, with a flotilla of paper boats in the Chifley Resort pool. A zany poolside performance by the Dusty Feet Dance Collective provided light relief after the obligatory speeches. Our film clip also has chair of Red Hot Arts, Kalikamurti Suich, and festival and events manager Scott Large, explain why they are heart and soul immersed in the annual spectacle. The first event is as soon as next weekend – the hugely popular Wearable Art Awards, where the arts of bodily adornment are taken in ever more unexpected directions. The festival proper kicks off on September 9 with the sunset street parade leading into a weekend of music, performance, workshops, a children’s carnival, all at the POD Space at Anzac Oval. Imported drawcard for the Friday night is urban roots act Blue King Brown, fronted by Natalie Pa’apa’a, supported by local bands Dr Strangeways and Tjupi Band. The Bush Bands Bash takes to the stage on the Saturday night, while Desert Divas – women vocalists from around the region – will perform at lunchtime. The Darwin Symphony Orchestra are the Sunday night attraction, combining with singers Warren H Williams, Catherine Satour and Jacinta Price for an event called Big Sky Country. The orchestra will also perform at the Desert Park on the Tuesday (Sept 13), with NT Administrator Tom Pauling reciting Shakespearian sonnets to a composition by Cathy Applegate. A play about the extraordinary Olive Pink, called The First Garden, will have its premiere the following weekend. 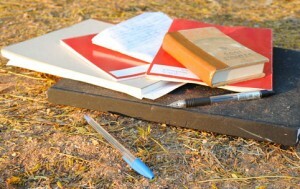 The play has been written by Chris and Natasha Raja and will be presented at Olive Pink Botanic Garden. Desert Mob at Araluen is the premier visual arts event of the festival, but there will also be some interesting shows around town: Souvenir, a reinterpretation of the “red centre” at Watch This Space; work from the dynamic Tjungu Palya Art Centre at RAFT Artspace; a first solo show for Kay Rubuntja Naparrula at Muk Muk; and an intriguing artists “lock in” at the empty shopfront next to Monte’s. Utopia homelands in the Northern Territory. which government is building and maintaining infrastructure. qualification of this dramatic claim. mentioning that she is the president of her shire. about 30 kms from Arlparra. Source: Amnesty International, Lucas Jordan. 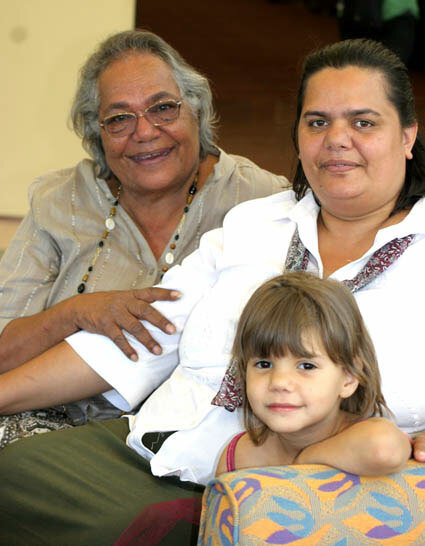 Above: Rosalie Kunoth-Monks, with daughter Ngarla and granddaughter Ruby, in 2006. From the Alice News archive. The best guess for this development cost per block is $60,000. A nice little earner, but no great help for the – at least then – drastic land shortage and the skyrocketing prices. A $3m contract to redevelop the Royal Flying Doctor tourist centre in Alice Springs has been awarded to Probuild NT Pty Ltd. 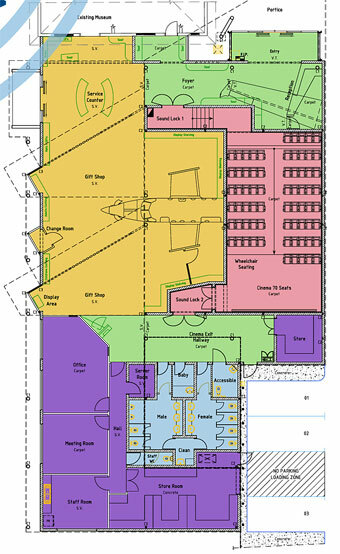 The project includes a 70 seat theatre, interactive information portals, increased retail space and a full scale replica of the fuselage of an operational Pilatus PC 12 Aircraft. 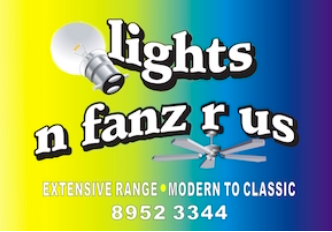 If you think politics is dull and PC, here’s proof that in the Territory it’s not. The live cattle export industry has a lower mortality rate on its ships than P&O cruises, says Shadow Business Minister, David Tollner. Calling on the Chief Minister to push for a fighting fund promoting the industry “down south”, he says the live export and the pastoral industries “should be a source of national pride. Mr Tollner says: “Cattle ships are sophisticated feed lots which keep animals healthy en-route to overseas markets, there are nutritionists on the ground in Indonesia and the industry supports the livelihoods of thousands of Australian businesses and families. • Shadow Minister for Transport Adam Giles (pictured) yesterday re-stated the Country Liberals commitment to open speed limits. He says they were removed in 2007 by the current Labor Government after undertaking a road safety review. “That review found that tourists, young drivers and Indigenous Territorians were over represented in the Territory’s road toll. “The review also identified drink driving and not wearing seat belts as the two main contributing factors. “Speed was never isolated as the sole cause of the majority of accidents. “Official road toll figures in 2006 were 44. Following the removal of open speed limits the toll increased to 57 and then 75. • Shadow Treasurer John Elferink says under Labor, the Territory’s net debt has blown out to $6.7billion, including liabilities. A dollar coin weighs 9 grams, is 25mm in diameter and 3mm thick. There are 111 dollar coins in a kilo, 111,111 in a tonne. – It would take $2.2million to fill a 20 tonne road train trailer and $6.7million to fill a three trailer road train. – It would take 1000 road trains – extending about 50km – to haul the Territory’s debt plus liabilities. – A $1 coin covers an area of about 500mm square and it would take $2million to fill 1km square. 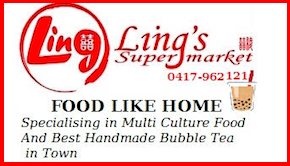 – Darwin’s area is 112km square. Placing all our dollar coins within Darwin’s footprint would make a stack 90cm high. 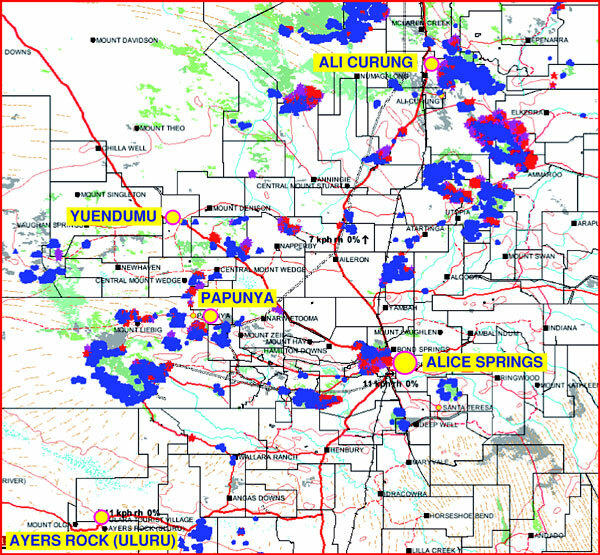 – Stacked on the Parliament House footprint, which is 12,900 metres square, the Territory’s debt with liabilities would make a stack 7.8km high. – Joined end to end, the $6.8billion debt with liabilities in dollar coins would stretch 167,500km – over four times around the world. – Under Labor, the Territory has accumulated a mountain of debt – approximately $29,000 for every man woman and child and $56,000 per taxpayer. An aggresively worded sign about dog control, posted by a Central Desert Shire officer at the store in the western desert settlement of Nyirripi, has been removed. 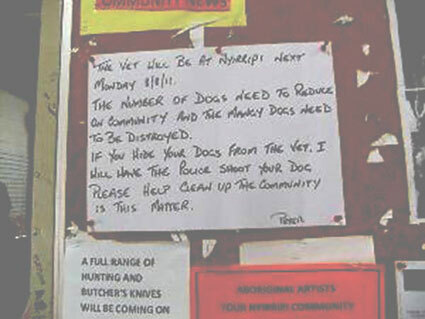 The sign included a threat that dogs hidden from the visiting vet would be shot. 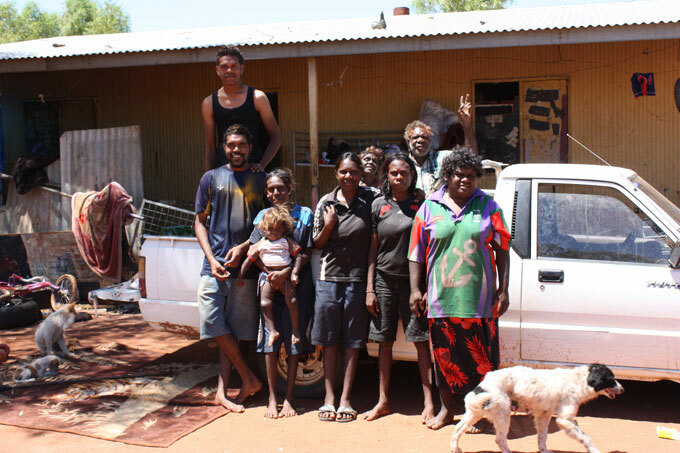 Nyirripi has a population of some 320 and is roughly 440 km north-west of Alice Springs, or 150 kms west-southwest of Yuendumu. CEO of Central Desert Shire, Roydon Roberston, said he became aware of the notice yesterday (Sunday) and “ordered that it be removed”. He said the notice was placed by the shire officer “in conjunction with senior community members”. “No authority was given or would have been given by Executive Management as the sign is not in keeping with Council Policy. 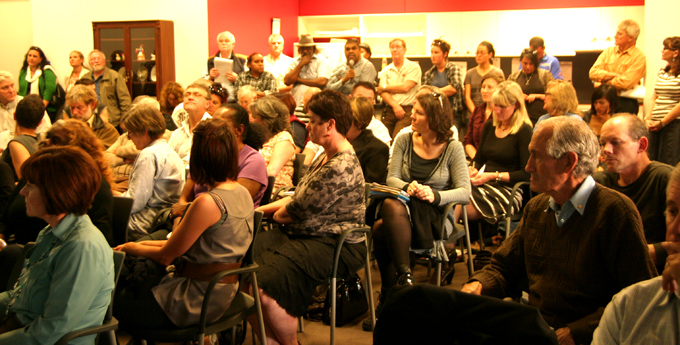 Further discussions will be held with the staff member involved,” said Mr Robertson. A vet is in the community today – as advised by the sign – and is expected to attend to 15 dogs today and a total of 30 before leaving tomorrow. The shire’s Dog Management Policy, adopted in October 2008, stipulates a maximum of two dogs per household. Mr Robertson says compliance with the policy has been “mixed” across the shire, while reported dog problems have “escalated” at Nyirrpi, becoming “worse than other communities”. He says the shire council has received numerous complaints from government agencies and council staff concerning dogs, including packs of roaming dogs. 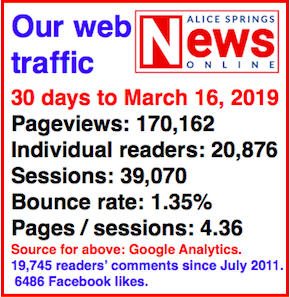 It was one of the starker statements of the two and half hour public meeting held in Alice on Tuesday evening, about the second phase of the Federal Intervention. The jobs are with night patrol services: “No-one is saying night patrol is an easy job, but it is a job,” said Ms McNee. How to start? How to end? And what’s in the middle? A jelly belly paunch, a rippling washboard or taut curves? I used to be a beekeeper. Keeping bees was an interesting one amongst the many incarnations I’ve had in the employment world. I’ve been a wine-maker’s sidekick or ‘lab technician’ as my CV states. I’ve cooked, cleaned, gardened, painted and bar wenched at a truck stop. Looked after baby birds in Ireland and fingered beautiful coats, hats ‘n’ scarves in smoky cloakrooms in Paris. And of course I’ve made countless coffees and waited thousands of tables. Police will be providing protection from criminals and departmental officials assistance with “compliance and governance,” says Chief Minister.